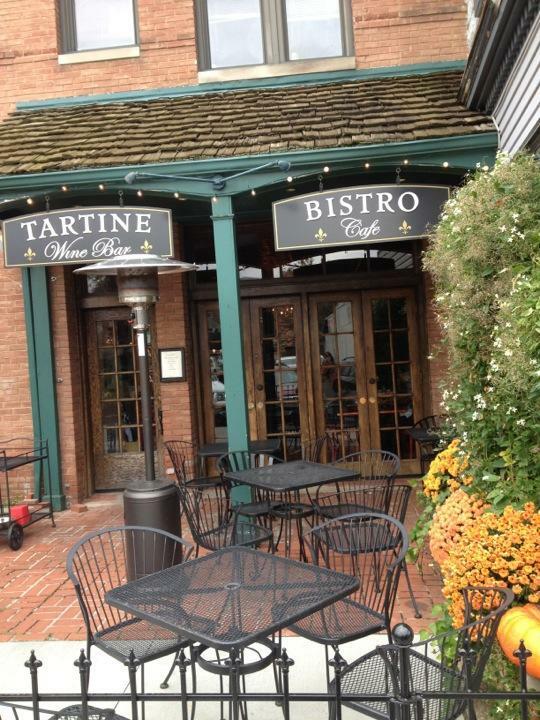 This little French-American bistro in Rocky River is a great place to visit if you want a little soothing French cuisine. Despite its address on Detroit, it is actually on Old Detroit nestled in the Old River Shopping Area. The bistro is named for its tartine, a toasted French bread sandwich topped with luxurious slow-roasted meats like pork, duck and beef. The space is small and is decorated like a dark little bistro with a large bar dominating the space. The red ceiling tiles lend the place a pop of color. We shared a space near the door, otherwise the photos would not have come out as well as they did. We started our meal with a drink and several appetizers. There were four of us for dinner, and we split the Baked Brie en Croute and the Roasted Dates stuffed with goat cheese and sprinkled with a port wine syrup and diced bacon. Both were piping hot and really hit the spot. The brie was served with water crackers and I could have eaten one by myself. 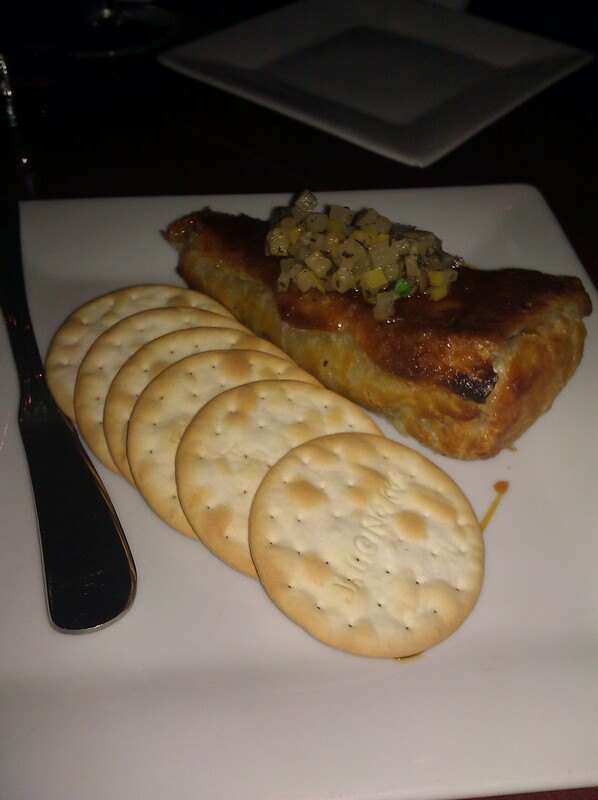 The puffed pastry was crisp and the brie was perfectly melty. 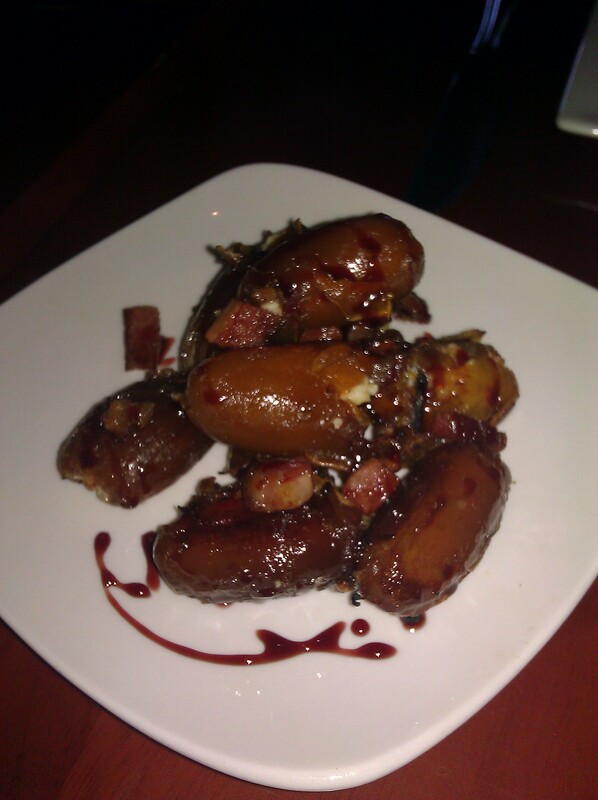 The stuffed dates came out hot and stole everyone’s hearts. Instead of the usual preparation (dates wrapped in bacon), it is served as a plate of stuffed dates topped with crispy crumbled bacon. It isn’t something I would normally order, but I was quickly won over. They were the unanimous favorite. If you like a bit of sweet be sure to try these! One of my dining companions ordered the Frisée salad and just raved about it. 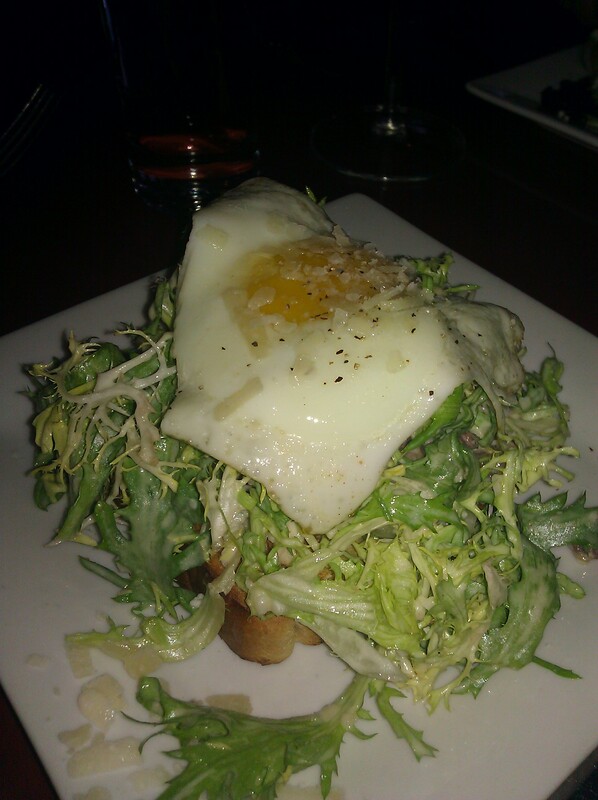 The Frisée features frisée lettuce topped with bacon lardons, a fried egg, hollandaise vinaigrette over toasted brioche bread. I had a bite and have to say that this was an outstanding salad. I have heard wonderful things about the Beet Salad, which is served with goat cheese and a honey vinaigrette. Next time. 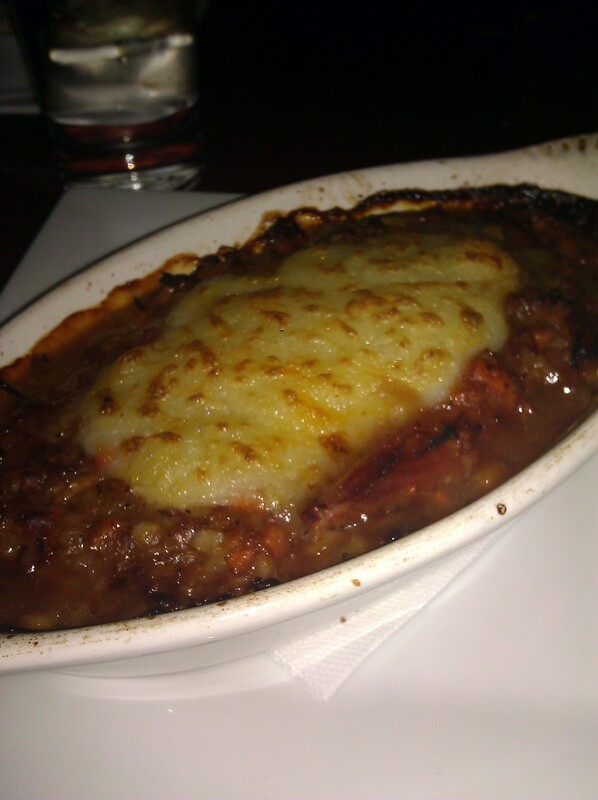 Being the French onion soup fan that I am, I had to order the Onion Soup Gratinée. The onions were perfectly caramelized and were accompanied by bits of beef and an aged cheddar crouton in a beef broth that was peppery and not too salty. It was topped with lots of yummy cheese. Just look at that broiled goodness. What’s not to love? 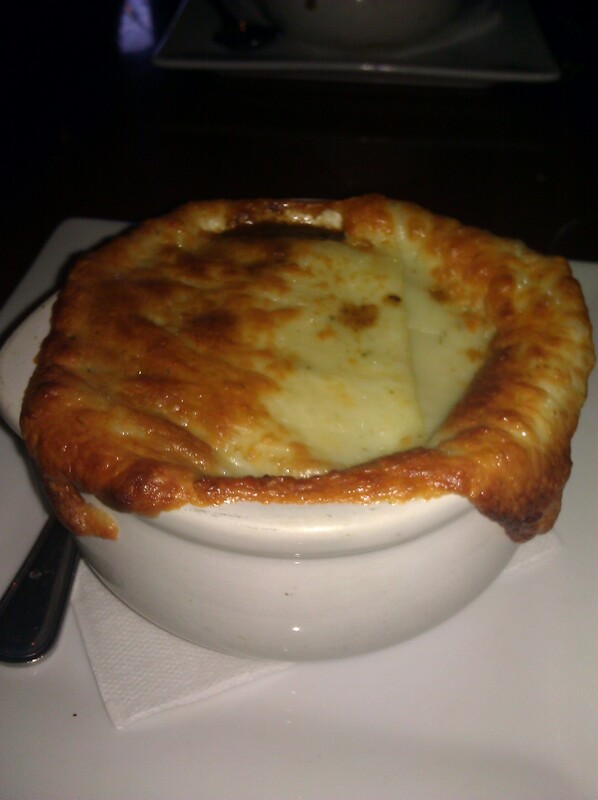 This was an excellent French onion soup. I particularly loved the aged cheddar crouton. I would definitely rank it up there with one of the best I’ve ever hard. 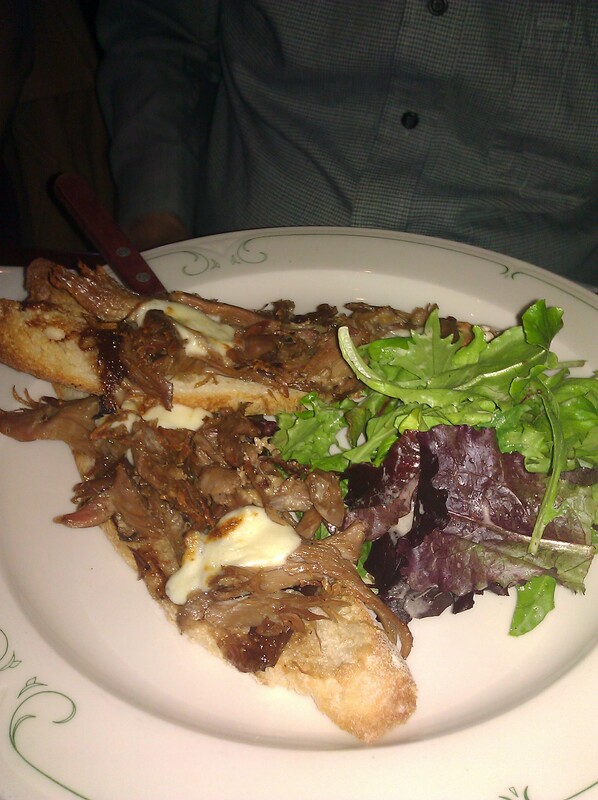 The duck confit tartine was a huge hit with most of us at the table. I loved my order and would order it again in a heartbeat. The duck had been slow roasted and pulled off the bone to produce a succulent topping for the French bread toast. I liked the brie, but was glad there wasn’t a lot of it on the tartine. I don’t know if brie pairs well with duck. I would have been happy with a brie tartine on its own. 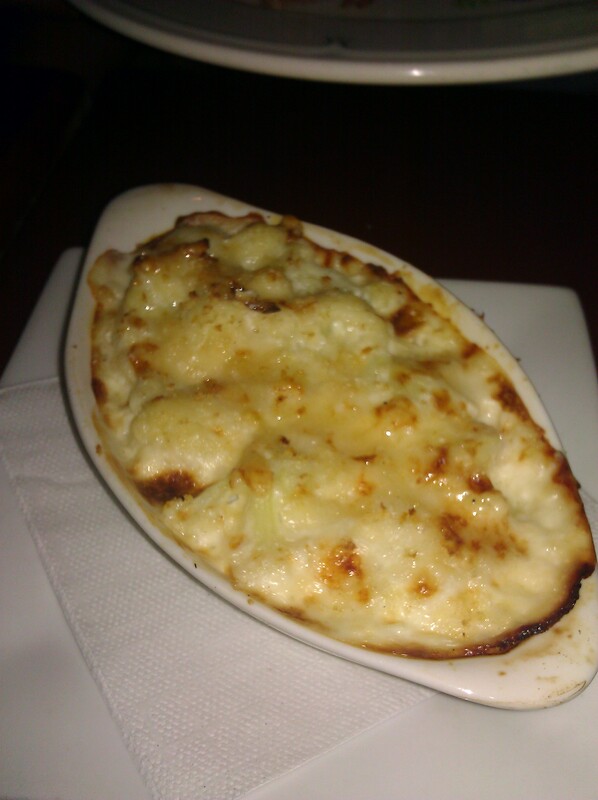 Another surprising standout was the cauliflower gratin. This warm side dish showed off cauliflower in a deliciously cheesy gratin. Everyone who had a bite loved it – even those who were not fans of cauliflower. 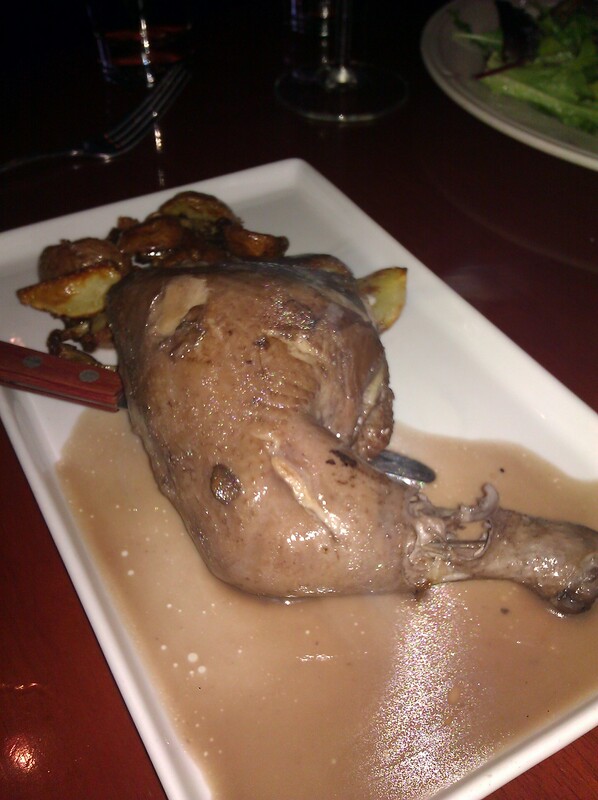 Another one of my fellow diners loved his roasted duck special. He orders duck whenever it is on a menu and was quite pleased. It was served with roasted potatoes that were perfectly cooked. I’m not sure what this entree was, but it is too beautiful not to share. It may be a lamb stew, which is not currently on the menu. Overall this place was a huge hit. One of my friends who wasn’t there that night goes there quite often, and the restaurant certainly has its regulars and fans. I only wish I lived closer. I would be there all the time. I can just imagine how cozy it is in the winter time, with all that delicious food to warm you up. The bistro also bills itself as a wine bar. They just celebrated their 5th anniversary on Bastille Day this past July. May they see many more years.